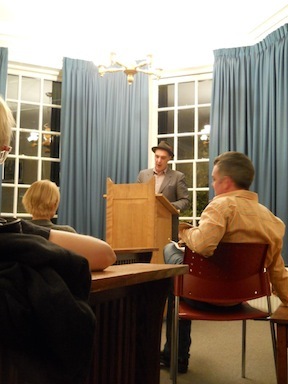 Last night, Canadian musician and author Dave Bidini read from his new book, Writing Gordon Lightfoot: The Man, The Music, and The World in 1972. It's Bidini's 10th book. As he described to those in attendance at Scott House, Traill College, it's the first time he's written a book about one person. Previous books have covered Canadian Rock during the fledgling years of Bidini's former band The Rheostatics, as well as his other love—sports. Those books told stories about hockey and baseball from Bidini's unique Canadian perspective. 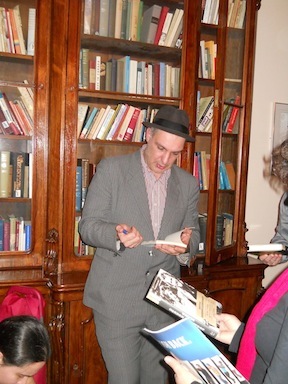 Last night Bidini read one chapter from the book, regaled with interesting and entertaining anecdotes before taking questions. It turns out, Lightfoot does not do interviews, preferring to not look back on his history. Bidini, working without any help from the subject, wrote the book based on interviews with those who were around Lightfoot during a pivotal week in 1972, piecing together the story of this Canadian songwriting legend during what must have been a meteoric rise in fame. The storyline builds from the 1972 Mariposa Folk Festival, where legends Bob Dylan, Joni Mitchell, Neil Young and Lightfoot were seemingly drawn together in one place, at one time. Based on Bidini's talk last night, this will be a highly informative read. The book was launched two weeks ago and should prove to be a fun read for those who have a soft spot for Canadian music and pop culture. Lightfoot fans are sure to be pleased.